Several times within the last week, the skies have turned dark and grey, promising for some much-needed rain for area farmers. But the clouds, while looking ominous, have delivered less rain than many area farmers desired. "We need a lot more rain," said Larry Rien, who farms east of Paynesville. His crops are starting to show the stress from all the heat and dry weather. A barley field north of Paynesville was a tangled mess last week following strong windson Thursday morning. The amounts of rainfall varied across the area. Rien reported a half inch of moisture, while Leta Beier by Regal received only a quarter inch of rain last Thursday. North of Paynesville, reports showed anywhere from three to five-tenths of an inch. "I thought we would get more rain as dark as the clouds were," said Beier. Deb Schmeising, who farms near St. Martin, reported they only had three-tenths of an inch of rain Monday morning. "It's more than what we had yesterday," she said. Cyril Spanier, who also farms north of Paynesville, said the crops were looking healthier Thursday than on Wednesday, thanks to the small amount of rain. "We need twice the amount than what we received," he said. "We received more wind than rain." On Monday, Spanier received only three-tenths of an inch of rain compared to over an inch by Paynesville. "The rain was real spotty," he added. Farmers south of Paynesville had to consider themselves lucky after receiving more of the rain. Neal and Inez Jones, south of Lake Koronis, were grinning from ear to ear as they received 1.7 inches of rain on Thursday morning. The rain is needed because of a month of dry weather following the wet spring. Dan Martens, the extension educator for Benton County, said farmers have seen everything this spring and summer, from one end of the spectrum to another, from cold and wet to hot and dry. Harold Thielen keeps track of the rainfall on the south side of Lake Koronis for the Koronis Lake Association. According to his records, the area received three inches of rain in June. The normal amount of rainfall for June is over four and a half inches. Furthermore, most of that rain fell during the first 15 days of June, when 2.16 inches of rain fell. Thielen recorded less than an inch of rain for the rest of June, and had recorded less than an inch for July until rain hit the south side of Koronis this week. Fields of oats, wheat, and barley are showing the effects of the wind from the weather system that moved through Thursday as the fields look like a tangled mess. More plants were knocked down by the wind on Monday. Where the fields have clay and loam soil types, the crops are holding up well because of all the subsoil moisture from the spring rains, said Dave Schwartz, the extension educator for Meeker County. Those in sandy soils are showing stress. The corn plants on the sand hills are curling up due to the lack of rain and heat stress, agreed Spanier. Corn that is looking shriveled could still come back if there is any green color in the plant, Martens said. If the plant is showing a lot of brown, it won't survive. If the green is on the grey side, there is a chance it would respond to rain. "The corn will still tassel and make ears, but it's questionable if the ears will fill out," Martens said. Rien said he has three fields of corn that is tasseling prematurely Ð at only four or five feet of height Ð due to the heat. The Joneses' corn was looking stressed when they were fortunate enough to receive moisture. "The corn should be tasseling now with the rain," Inez said. Schwartz said soybeans can take drought conditions better than corn. The soybeans, despite being shorter than normal, are holding their own, Rien agreed. 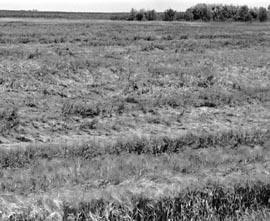 Martens offered farmers some harvesting tips for the shorter than normal soybeans. Farmers should combine at slower speeds in order to catch the pods that are growing close to the ground. Farmers will also face a tougher decision about when to harvest, as the beans in a single field might not all be ready to harvest at the same time. "The beans can still grow if we get some rain," Martens stressed. Corn height averages 46 inches this year, compared to 61 inches a year ago. Soybeans average 14 inches tall this year, compared to 17 a year ago, according to the Minnesota Ag Statistics Service. Area residents might be complaining about the high humidity, but Schwartz said the humidity is helpful to the crops, providing some of the needed moisture. "I'm not looking for the crops we have had the last two years," Schwartz said. The late start in the spring trimmed some of the yields, then terribly wet field conditions in the first half of June, followed by the dry weather for the past month took a toll on the crops, reducing prospective yields further. The weather has also impacted hay cuttings. The first hay cutting, in early June, occurred during a wet stretch that saw rain on nine of the first 15 days of June. Some farmers lost wet hay crops in the field. The recent dry weather has been nice for cutting a second alfalfa crop, but unless the area gets more rain, not enough might grow for a third cutting, Martens said.